Use what is fresh. In this case, that means the flowers too! 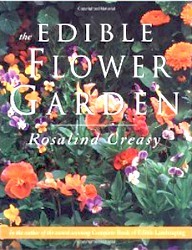 In The Edible Flower Garden, Rosalind Creasy shares and explains the beautiful world of cooking with colorful and tasty flowers. Emphasis is given to creating gardens that will supply those flowers. It takes a lot of flowers for most recipes, so it is good to know how many of each to plant and when to harvest. While traditional herbal flowers like lavender and borage are included, there are also selections on vegetable flowers, as well as some more unusual flowers like lilacs, apple blossoms and begonias. 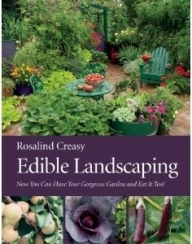 I particularly enjoyed reading about Ms. Creasy's experiences with Alice Waters of Chez Panisse and the edible flower gardens they created to supply fresh flowers to this world renowned restaurant. Of course, the beautiful photos of the Edible Flower Canapés, the Pineapple Sage Salsa and the Rose Petal Sorbet weren't bad either. 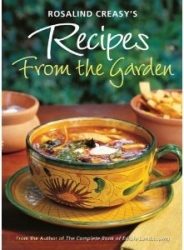 Additional books on edible flowers you might enjoy!